The second video of our countdown actually comes from the same outing as the first video which was posted yesterday. Believe it or not, it was the second bass of the morning, coming only three minutes after the inaugural GoPro catch. Can you tell that I am having fun with this whole new aspect of the fishing trip? Sure thing, as situations that I’ve experienced countless times over the previous 35 years or so kind of take on new life when caught on film (I know, no film, but that’s the way I talk so that’s the way I write). I also thought that a piece featuring “Second Chances” in the title just logically fit as the second submission in the countdown. Indeed, there is occasionally a method to my madness and a tinge of planning to some of this stuff. So, let’s set the scene before I shift into Bass Professor mode and break this clip down in order to pass along a couple valuable topwater bass fishing lessons. What I am doing here is casting a topwater bait known as a Whopper Plopper across a point that drops off into 8-10 foot of water on all three sides of its ledgelike setup. Classic summer bass magnet in the lowlight conditions early or late in the day. 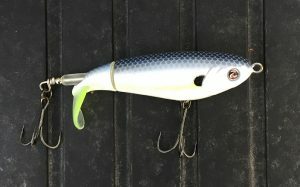 The Whopper Plopper (pictured below) features a propeller sort of rear end which sputters across the surface when twitched or reeled. Lesson One – Do not set the hook on a topwater bait when you see the fish strike it, wait until you actually feel the weight of the fish. Easier said than done no matter how long you have been topwater fishing. My error in this regard occurs around the 0:04 mark of the clip as I essentially jerk the lure away from a “hot” fish that has taken two swipes at the plug and likely will keep after it until he gets it right. Lesson Two, Plan A – Go right back after the fish either with the same bait or what is often called a “follow-up” lure as it is likely still hanging in the general area and perhaps wondering how its breakfast got away. In this case, I opted for a repeat with the Whopper Plopper but made sure to cast well beyond where the strikes had occurred. My intent is to not land on top of the fish but rather cause a commotion several yards away and then bring it right over the top of what I hope is still a fired up fish. Worked like it was supposed to on this occasion and always cool when they make you look smart. Lesson Two, Plan B – You can also resort to the “follow up” lure approach with a sinking lure that is pitched right into the vicinity of the strike as quickly as possible after the swing and a miss by the bass (and angler in this case). My go to lure in this scenario is a weightless wacky rigged Senko. 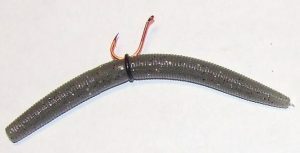 It enters the water above that bass with less commotion and its waving action on a slow fall is often too much to resist.